Others believe it is the beginning of the Golden Age. Gold representing the alchemy of time and consciousness. There are many correlations between 2012 and Zero Point. It is a time said to bring enlightenment upon humanity. It can be seen as a time of accelerated human consciousness as well as accelerated physical earth changes. Recognizing and healing our issues is to understand this evolutionary process. Many are receiving prompts such as 11:11, and increased sense of awareness as we approach this year 2012. Could this be humanity's opportunity to create his/her own destiny? Our solar system is currently traversing through a Photon belt. A photon belt is an increase in particles of light within our atmosphere. As we traverse through this belt, the earth's atmosphere becomes more dense causing change on a grand scale. This band is a band our solar systems passes into every 26,000 years and takes 2000 years to pass from one edge to the other. At the 1000 year point (midpoint) we are at the densest point within this belt. This mid point coincides with a point in history described by the ancients as the ‘shift of the ages.' Linking us to the date 2012. 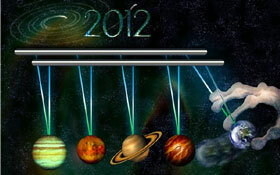 On December 21, 2012 the Earth will complete this 26,000 year cycle. The sun will rise and conjunct with the intersection of the Milky Way and the ecliptic plane. In mythology, the sign of the Suntelia Aion is shown as the sun rising out of the mouth of the Oroborus which is said to occur on the winter solstice December 21, 2012 at 11:11 UT. This is known as the Cosmic Cross, Shift of the Ages, or Convergence. The mythical Oroborus is a symbol representing the Milky Way galaxy. Myth refers to a serpent of light residing in the heavens. The Milky Way is this serpent, and viewed at galactic central point near Sagittarius, this serpent eats its own tail. Many ancients used the galaxy to calculate cosmic and earth cycles. During the winter solstice the serpent will eat its tail referring to a cycle of catastrophe and a New Age.